​the pharmacists will ask for the name of the medication so it can be disposed of properly. 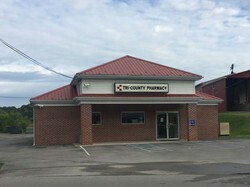 Conveniently located next door to Community Care of Rock Cave, Tri-County Pharmacy stocks a vast assortment of pharmaceuticals and can fill your prescriptions with minimal wait. Since 2005, Tri-County Pharmacy’s professional and friendly staff provides the highest level of quality care to patients in Rock Cave and surrounding areas. The Pharmacy has a vast array of retail and over-the-counter medications. Most major insurances are accepted. The Pharmacy, in conjunction with Community Care of Rock Cave, provides discount drug programs for its patients. For details and requirements on the various discount programs offered contact one of our knowledgeable Pharmacists who will be more than willing to help. Tri-County Pharmacy also provides discount programs for CareXpress and Pediatrics, Little Meadow Health Center, West Milford Community Health Center, Community Care and CareXpress of Flatwoods, and Community Care of Marlinton. The pharmacy is also open to the general public and can fill prescriptions from any medical provider. In addition to the pharmacy services you will also find a good selection of Swan Creek Candles, Leanin’ Tree Cards for all occasions, and LorAnn Oils in many different flavors. An automated refill line is available 24 hours a day, 7 days per week to accept your refill requests. Call (304) 924-6784. Talk with your healthcare provider about the convenience and benefits of using the Rock Cave Pharmacy and request that your prescriptions be filled here. If you are uninsured, you may qualify for our reduced prescription pricing.